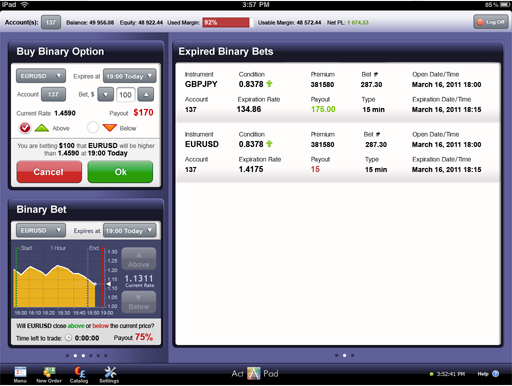 BinaryOptionsNow – ActForex has for a long time already been a major trading technology provider. Its leading product is the ActTrader, which enables online traders to swiftly execute trades in a variety of financial markets and assets. In August 2011, ActForex decided to enter the binary options market as well and launched its long-anticipated ActTrader binary options platform. The new ActBinary binary options platform was released last year with the intention of complementing ActForex’s offering in the binary options market. ActForex is one of the biggest white label trading software providers and binary options is the biggest increasing online trading market on the globe so the ActBinary platform has been one of ActTrader’s most anticipated releases. Based on the previous statement it was evident that at some point ActForex would release a new all-in-all online binary options trading platform. The biggest innovation achieved though the new release is the fact that it’s integrated into the popular ActTrader platform which means that traders won’t have to set up additional binary option trading accounts or install additional software in order to trade. The new ActForex binary options platform is integrated into the famous ActTrader platform which means that it has similar usability and navigational structure. The main aspect of the ActTrader platform is that it’s extremely intuitive allowing traders to master all aspects of the interface rapidly. The new ActBinary integrated platform also has these attributes, which means that new traders who never used ActTrader before will have an easy time learning all aspects of the new service. Traders who already used the ActTrader platform before will manage to use the new service instantly without any supplementary instructions. The new binary options platform was not developed to be fancy with all kinds of distracting colors and animations. The lack of all kinds of fancy elements, on the other hand, makes navigation even easier and straight to the point. In the end, efficiency is what matters the most in this business and the new ActTrader binary options platform perfectly lives up to these standards. For regular PC users the ActForex binary options platform can be accessed through the popular ActTrader platform. This platform offers the best trading efficiency, biggest working space and most detailed charts and graphs. Most other binary options platforms by other providers aren’t this simple and to the point which results in traders not finding what they need and thus missing important trades. This will never happen with the ActTrader-integrated binary options platform since it combines simplicity with efficiency. The new binary options platform of ActForex is also available on the venture’s iPad product, the ActPad. The ActPad was designed to offer iPad users the flexibility and efficiency of the ActTrader. Similar to the ActTrader platform, the ActPad was also carefully crafted to ensure easy navigation and usability. This is exactly the same with the ActPad binary options platform as well. Binary options traders will now have the possibility to enjoy the benefits of binary options trading through a single account and via their iPads. 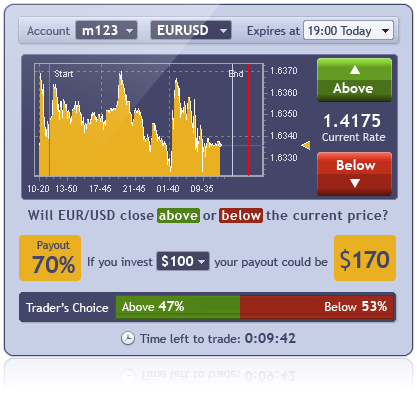 The new application is easy to use and highly recommended to traders new to binary options. The ActPhone and ActDroid apps were developed with the intention of providing the ActTrader platform to iPhone and Android devices. These two apps virtually revolutionized the online trading industry by allowing traders to access their accounts from virtually any location. Now, binary options traders will have the possibility to trade using both the ActPhone and ActDroid apps as well. Similar to the main ActTrader product, the new binary options trading platform can be accessed directly in these apps without opening a separate app and setting up a new account. Since its release, the new ActForex binary options trading platform has attracted many users. This is because it offers a comprehensive toolset for efficient binary options trading. All variants of the new platform combine efficiency with simplicity while offering the trader detailed and useful charts for maximizing profits. Binary options is one of the most rewarding forms of online trading and the new trading platform will allow traders to fully exploit the benefits of this market. The ActForex binary options platform should be the top choice for both new and old online traders alike.